Nathan Marsh is enjoying his second season on the North Country Falcons tennis team, having come late to the program. A lifelong hockey and soccer player, Marsh has emerged as one of the top four singles players in the Falcons tennis program. NEWPORT — The North Country Falcons tennis team extended its winning streak to two matches and evened up their season record at 3-3 with a 4-3 win over the visiting U-32 Raiders on Thursday, May 8. Coming into the contest, Coach Gary Atchinson predicted that the victory would be attained or lost on the strength of the singles matches. The Falcons team has only nine players — the exact number needed to field a team for each match. With very little wiggle room, it falls on the team to perform to its maximum capability each and every time. So far, they have not disappointed, Coach Atchinson said. All three of the matches North Country has lost against Harwood, BFA-St. Albans and Middlebury were by margins of 4-3. The Falcons have picked up two wins against U-32, both times by 4-3 margins while a win against Montpelier was 5-2. One of the Falcons top four singles players, Nathan Marsh, is a surprising new addition to the team. Marsh, a senior, only started playing in his junior year. Since the age of four, he has played primarily hockey and soccer. 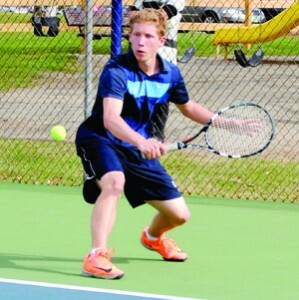 Falcon Thomas Durivage has earned his spot as the number two tennis player for the North Country tennis team. Coach Gary Atchinson credits seniors like Durivage for providing a steadying influence for his relatively inexperienced team. While there isn’t much in common between Marsh’s three chosen sports, one unexpected benefit of his unusual trio of activities has transferred over. While new to the sport, Marsh’s experiences in team sports, and his growing comfort with tennis, makes him and his fellow top four singles players, Durivage, Parsons-Grayson and Fred Petzoldt, provide the kind of leadership that really inspires their teammates, Coach Atchinson said. Parsons-Grayson dispatched Aaron Thompson 6-1, 6-1 in the number-one singles match, while Durivage ousted Ethan Fielder 6-0, 6-0 in number-two singles. Marsh battled Chris Alderghetti to a 6-3, 6-1 win in number-three singles. U-32 responded in force when Zach Elmore and Nick Grace took the number-one doubles contest from Falcons Henry DeLaBruere and Corey Davis 6-1, 6-3. Raider Corey Kline then ousted Falcon Paul Croizet 6-0, 6-1 in the number-five singles. That left just the number-four singles and number-two doubles matches to determine the team win. “That makes both of these matches as important as ever,” Coach Atchinson said. Travers Parsons-Grayson has thrived on the courts in spite of the pressure of being North Country’s number one singles player. Parsons-Grayson dispatched his opponent, Aaron Thompson, 6-1, 6-1 as the Falcons won the day 4-3 over the visiting U-32 Raiders on Thursday. Fortunately for the Falcons, Petzoldt was able to defeat Jacob Toro 6-2, 6-2 to capture the number-four singles match and secure the team win for the Falcons. But that didn’t diminish the battle for the number-two doubles contest. Despite falling behind early in both sets, Falcons Ian Major and Nathan Grimm fought back valiantly nearly forcing a tie-breaker set. In the end, however, the early gains by Raiders Jordan Moore and Logan Middleton proved too much as U-32 took both sets 6-4, 6-4. With their win the Falcons evened their season record at 3-3 while U-32 slipped to 1-6 on the year.